This evening I decided to make Eggplant Ricotta Bake for dinner. I picked up some beautiful eggplant in the grocery store this weekend and thought this would be a perfect way to use them. It is a fairly simple recipe that I found a while ago on another blog and it doesn't require a lot of ingredients. 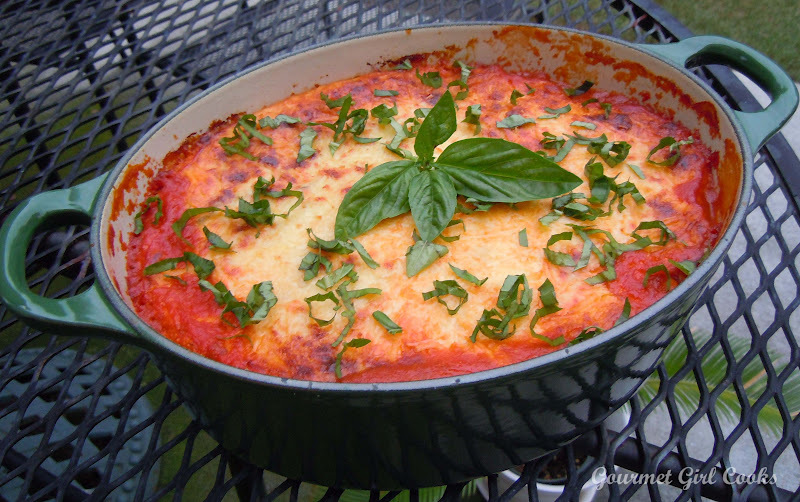 It uses eggplant, ricotta, Romano, eggs, fresh basil and marinara. This time I decided to use Mario Batali's Arrabiata sauce which is pretty spicy. You can oven roast the eggplant or grill it. I prefer it grilled because of the extra flavor it gives, so hubby grilled the eggplant for me when he got home. I have lots of fresh basil in the backyard to use so I picked a bunch of it while hubby was grilling (I used about 15 large leaves in the cheese filling as well as extra to sprinkle on top after it came out of the oven). I baked the casserole in my 3-1/2 quart oval Le Creuset casserole dish that my daughter bought me several years ago while she was working summer at Williams Sonoma. If you wanted to feed more people, you could easily double the recipe and use a deep 9 x 13 baking dish instead. If you absolutely must have meat in your meals, you could add meat to the sauce...but I prefer it just the way it is. If you eat pasta, you could serve that on the side...but I actually prefer it just as it is by itself. It is sort of a cross between Greek Moussaka without the meat and Eggplant Parmesan without the "breading" or the "fried" part. I snapped a couple pics below as well as the recipe. Enjoy! Preheat oven to 450 F. Brush both sides of the eggplant slices with olive oil, salt and pepper. Roast till tender and golden, about 20-30 minutes (you could also cook eggplant slices on a gas or charcoal grill until tender). In a bowl, whisk ricotta, eggs, 1/2 cup of the Romano cheese, fresh basil, salt and pepper. Lower temperature to 375. Brush the bottom and the sides of an 2-1/2 to 3 quart square or oblong casserole dish with oil. Place 1/4 of the roasted eggplant down; spread with half the marinara; another 1/4 layer of eggplant; half of the ricotta mixture. Repeat everything (1/4 eggplant, remaining half marinara, remaining 1/4 eggplant, ending with the remaining half of ricotta on top). Top with remaining 1/2 cup of Romano cheese. Bake uncovered at 375 degrees for 25 to 30 minutes. *Note: Let cool for about 15 minutes so that everything sets and it isn't runny. I just arrived at your site via the Wheat Belly Blog. Sooooo glad you are based in NZ so I don't have to go through figuring out what veges are and converting amounts back to metric. Hi K...glad you liked my blog. I am actually based in the US. I hope you are still able to easily make some of the recipes without too much trouble. Just put your recipe in the oven, can't wait to try it! I've never used ricotta and was surprised when I got home from the store to find the ricotta I'd picked up was fat free. Did you use fat free ricotta or should I look for ricotta made from whole milk? I'm sure the fat free ricotta will be just fine. I actually used whole milk, but it is strictly your personal preference. I've made it with part skim ricotta too. Hope you enjoy it! Remember to let it sit a bit when you take it from the oven before cutting it...or it won't give you "pretty pieces". This looks really yummy! 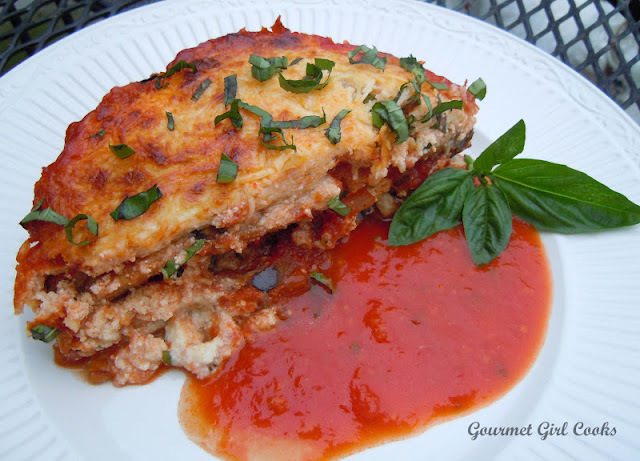 I love eggplant parmesan so this should be a new favorite. I'm limiting cheese and eggs in my diet lately in an effort to go vegan eventually. Do you have advice as to how I can make this with less dairy/eggs. Lisa, this was truly excellent! However, I made a mistake. The market had a special on eggplant, 3 for $1, so I bought 3, and got some extra ricotta. I used a baking pan that was too large, though, and didn't really have enough eggplant to create a solid bottom layer. I put all the ricotta on top of it, and finished off with what was left of the eggplant. I forgot how wonderfully eggplant and ricotta go together, and even though mine ended up a bit skimpy on the eggplant, I will happily eat the leftovers this week. Does all the marinara go on first layer of eggplant? It's a little confusing. Place 1/4 of the roasted eggplant down, spread with half the marinara; another 1/4 layer of eggplant; half of the ricotta mixture; repeat everything (1/4 eggplant, remaining half marinara, remaining 1/4 eggplant, ending with the remaining half of ricotta on top). Top with remaining 1/2 cup of Romano cheese. Sounds delicious. Could you please add the amount of carbs and sugar in this and your recipes. I'm a diabetic and this would be so helpful. Hi looks delish! Any idea, what calories are? There are folks that just don't like it. Sometimes larger eggplant have tons of seeds (which I don't care for). They can make the eggplant have a bitter flavor. I try and buy small to medium sized eggplant, if possible. This was an unusually nice eggplant with almost no seeds. It makes a huge difference. This didn't taste like eggplant so much as the sweetness of the onion, garlic, red peppers and roasted tomatoes. It was an extremely mild tasting eggplant. It was one of the best I've had in a while actually. If you use garlic, onion and sweet peppers and then season with salt and pepper and cook in olive oil, if it isn't an overly mature eggplant, it should pick up the flavors of what you add to it. Tried this dish and it is fantastic. Today I'm going to substitute zucchini. I'll Slightly cook it in the microwave and pat dry. I really like the filling. I'll let you how it turns out. I did try the zucchini. It was good, but I like the eggplant better. I have the eggplant in the oven right now. Can't wait for dinner. This would be a great dish for company. So delicious. Thanks for all your wonderful recipes. Do you have to extract the oil from the eggplant prior to roasting? Do you use the traditional purple eggplant? Approximately how much in weight?